Scientists have had to abandon their plan to investigate the waters around the world's biggest iceberg. 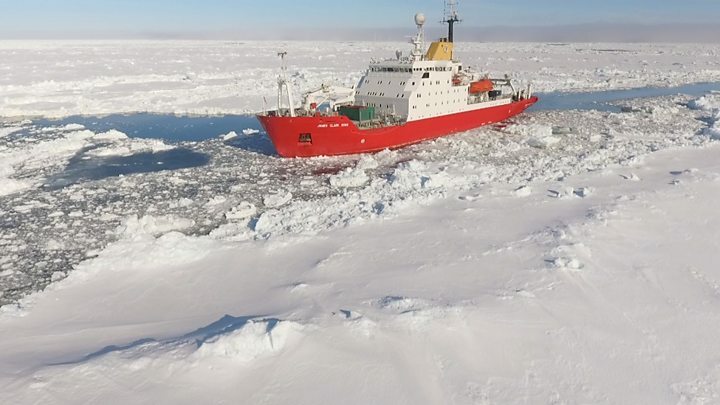 The team, led by the British Antarctic Survey, was thwarted in its attempts to reach the massive block known as A-68 by thick sea-ice in the Weddell Sea. The iceberg broke away from the Larsen C Ice Shelf on the eastern side of the Antarctic Peninsula last July. It revealed portions of the sea-floor that had been covered for many thousands of years. The team, which is on the Royal Research Ship James Clark Ross, had been hoping to sample what were likely to be new species. These animals would have had to adapt to an environment devoid of light to survive. "We knew that getting through the sea-ice to reach Larsen C would be difficult," said expedition leader Dr Katrin Linse. "Naturally, we are disappointed not to get there but safety must come first. "The captain and crew have been fantastic and pulled out all the stops to get us to the ice shelf, but our progress became too slow, with just 8km travelled in 24 hours and we still had over 400km to travel. Mother Nature has not been kind to us on our mission. "But we have a 'Plan B'; we will head north to areas which have never been sampled for benthic biodiversity. "The Prince Gustav Channel Ice Shelf and neighbouring Larsen A Ice Shelf collapsed in 1995. We'll be sampling deeper than we planned at Larsen C - down to 1,000m - so we're excited about what deep sea creatures we might find." The expedition has gone later in the Antarctic season than it would have been ideal, but the urgent proposal to go sample A-68's waters had to fit with BAS schedules that had long been agreed for this season. Normally, it takes a few years to put such a venture together. There should, however, still be an opportunity to visit the berg next year as many on the current expedition will join a German effort run out of the Alfred Wegener Institute. It will use the Research Vessel Polarstern. In the meantime, the BAS Plan B goes into action. It will see the team collect seafloor animals, microbes, plankton, sediments and water samples in the vicinity of the alternative ice shelves.